Guess the mass of snow finally got to me; been 'down' with the flu bug who is not very good company. Only likes flat pepsi, crackers and chicken soup. So glad and grateful to be back 'in the creative saddle' again. Hope you are all well and seeing signs of Spring. Still too early for crocuses here. Or maybe we can't see them through the snow. I give thanks for every little crocus that greets YOU this spring! Sorry you came down with the flu, but glad to hear you are feeling better. Off to a great start with your creativity! Have a great weekend. And we will love mother nature right back when those crocuses show their little faces!! I can't think of a better spring greeting than crocuses of all colors outside one's door! 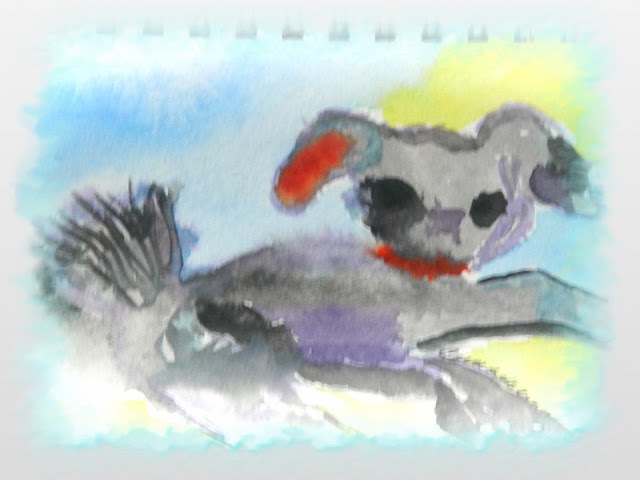 I love the impressionistic painting of your dog and the stunning black bird photograph. 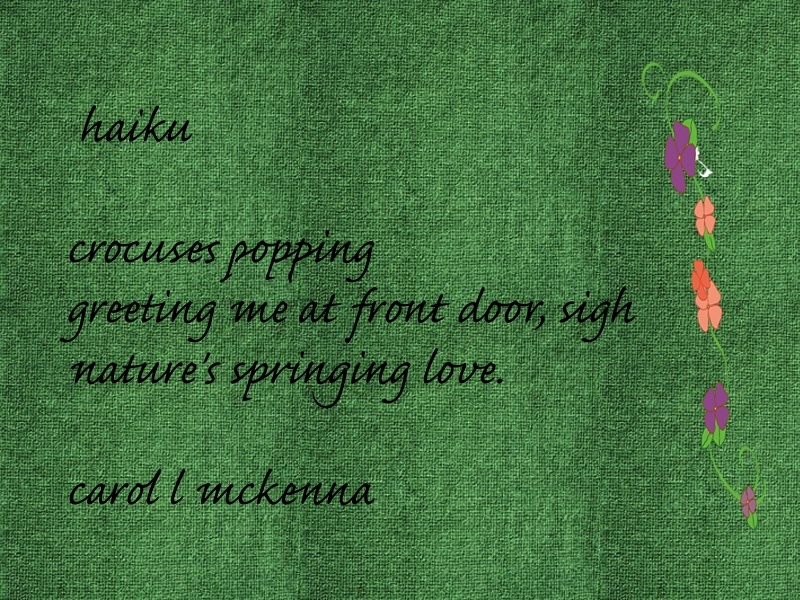 The vivid description of the crocus haiku also spoke to me. You and Muse dog have a blessed weekend, Carol. Beautiful photos, painting, and love how you present your haiku! They are very lovely! 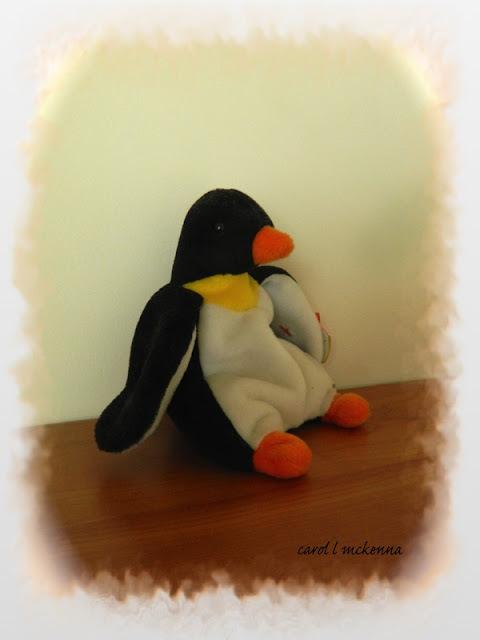 What an awesome post Carol, lovely images you share here with us. 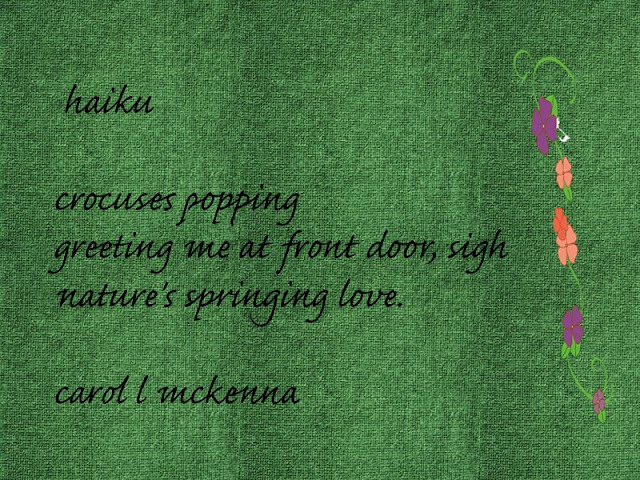 Your Carpe Diem haiku is very well written and yes crocuses are the colorful entries for the coming of Spring. Amazing painting. Could also be a fantasy landscape, remarkable! lovely sketch and poems! you take wonderful photos! Such a soft and huggable puppy! Happy PPF! The haikus are beautiful and from the photos, it looks like you live in a magical area. Lovely post and have a wonderful weekend! Loving all your beautiful work Carol and pleased to hear you are on the mend. Feel better ! Thanks for sharing all these treasures with us. I am on the look out for crocuses ! A very lovely painting, wonderful photos, awsome Haikus and a beautiful puppy. So much to see on your post. Thank you to be my newest follower. 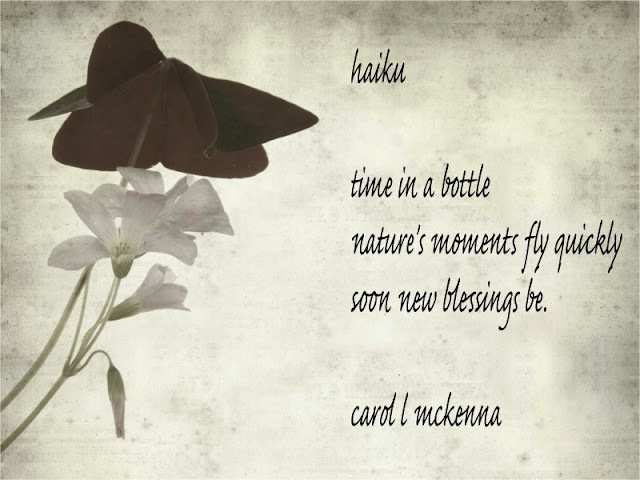 Your creative juices are flowing well Carol! Terrific haiku and I love that doggy painting. How sweet. Love your pieces and photos. Enjoyed your Haiku's, always spot on! Take care and have a great weekend. love your softly painted doggie. Your photographs are always so captivating and beautiful, and of course your haikus are really wonderful!! Happy PPF! I love your black & white photo and the photo out your window. So pretty! Your photography is beautiful as well as your art and haiku are. Always delightful visiting your blog, Carol. Wow, you are so busy with all of your link up participations. great for you. Your painting is just lovely and of course the Haiku poetry is fabulous as always. Your bird shots are always beautiful !!! Loved the pics, the first and last haiku. Its always a joy to visit, both for your pictures and the haiku. Beautiful photos and haiku. I like your watercolor. It is so delicate and sweet. Good to visit your blog again!!! have a lovely weekend! Love the connection between time in a bottle and Spring! Love that crocuses bloom at your door....Spring is coming. Always lovely words and pictures. Enjoyed them. Love your reflections through the blinds!! Hope you have a great weekend! Enjoy! The black and white is a lovely composition. You have a great mix of pix and words today. absolutely lovely haiku, it ads sunshine to any day!! love the crow shots - especially the b&w - and great reflections, too! Lindas...a imagem em p&b é a minha preferida. Um abraço! I love your little dog, the photographs and poems, you have so much talent, thank you for sharing! 'If I were a dog', my favoritest thing in the world must be most likely a belly rub! Great image and words. Cool collection, Carol! I never think to take photos of crows! Gorgeous light on a blanket of snow. Beautiful words and captures! Hope you're feeling 100% very soon. 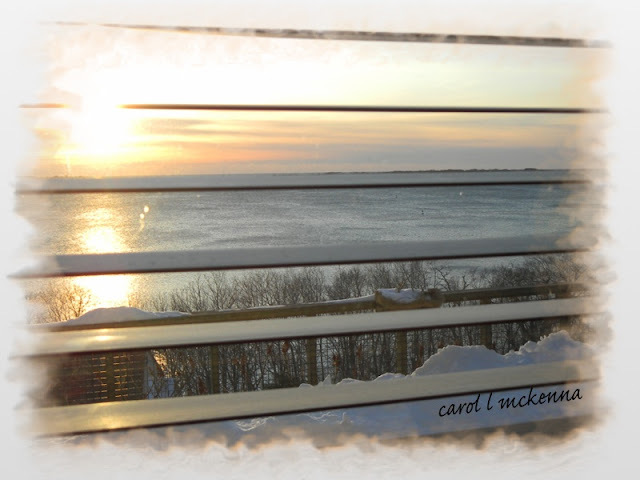 I love the wintery sea scene out the window- lovely selection of shots Carol. 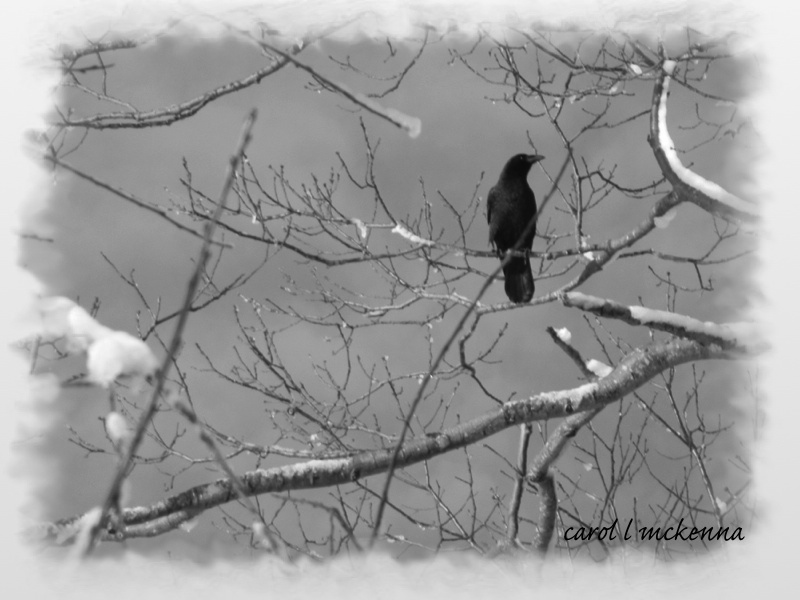 beautiful offerings Carol... especially loved the winter trees with crow photos. I grew up in the Midwest, where thunderheads were part of the summer landscape. Then I read of your "thunderheart," and I can't wait to hear one beating! Oh, sorry you have been sickie. Hope A.M. Dog was taking care of you and snuggling to keep you warm. 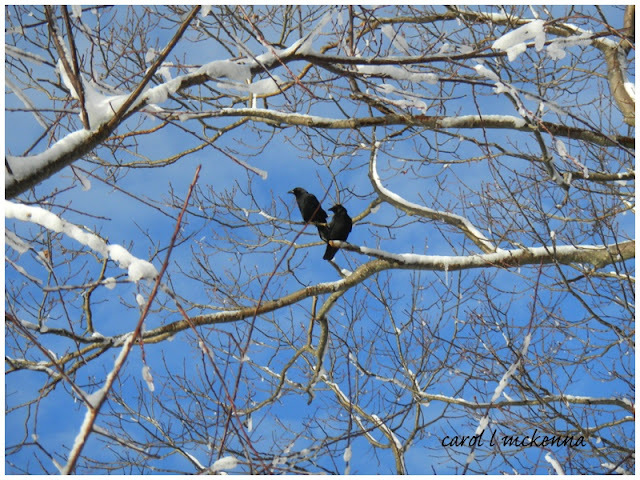 Even tho there is snow in the photo, I am especialy liking those crow shots. what a wondrous collection of marvelous images and words! my favorite photo was the wintry scene through the slats of the blinds. a wondrous collection of images and words! my favorite is the wintry scene viewed through the slats of the blind! What a nice post. I love that reflection shot and the black and white one. Your painting is very nice. i hope you are feeling much better, soon spring will come and melt all our hearts! So many goodies! That photo of the crows on the snowy limbs wins my first prize, however! Lovely post... I enjoyed the photographs very much especially the rooks (?) in the trees. I do hope you are feeling better. I have been trying to stay well drinking chamomile tea. The whole office is sick. 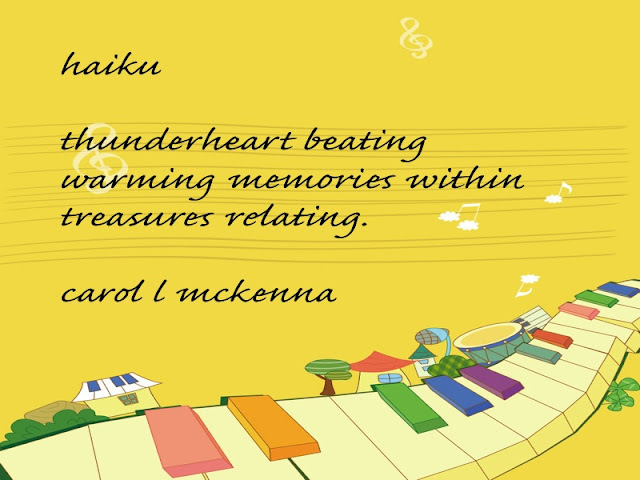 I love the way you present you haiku.. the words are lovely, the backgrounds delightful. You are inspiring.